I took this shot as I was coming back from taking bird shots for the Flight challenge. 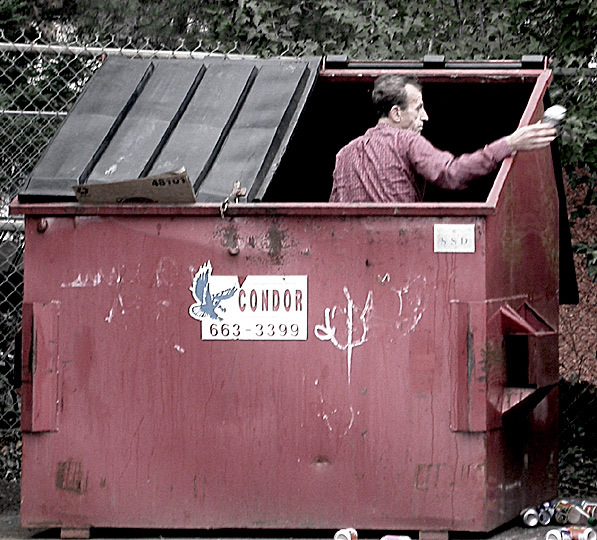 I heard cans hitting the groud and there was a man in the dumpster picking out all the cans for money! That really socked me. This could use some color enhancement. The colors aren't vibrant, they seem washed out. In fact, the leaves in the background almost look gray. Were you trying to desaturate the pic and leave only red and skin color? A bit of unsharp mask would've helped this too. Actually, in terms of the standard of living at the bottom, we've been surpassed by a few countries - but that's part of the irony. Nice statement. Seems appropriate to me. He's not scrounging for food, obviously, he's salvaging aluminum cans. A rich country should still not be wasteful. However, I do see your point and I don't think I should deduct any just because it might not seem all that ironic to me. Good capture, colors are ok.
sad but true but thanks to him those cans will be recycled. Wasteful idiots throwing recyclables away! I hope you gave him a dollar. You took this in Luxembourg ? There is not enough resolution. But I like the content of the image. Maybe he lost his wife's 10 carat diamond ring. Your title certainly adds poignancy to the shot. your message and image is great, but technical attributes are weak (poor focus, exposure). It is a decent photojournalism shot,though. Proudly hosted by Sargasso Networks. Current Server Time: 04/26/2019 09:39:23 AM EDT.